Lao government representatives evaded tough questioning at a U.N. review of the country’s rights record last week, speaking to points that had not been raised and saying that villagers arrested for refusing to leave confiscated land had sought to block the country’s development. Meeting in Geneva, Switzerland, from July 11 to 12, the U.N. Human Rights Committee (CCPR) examined for the first time the state of civil and political rights in communist Laos. The committee tracks the compliance of state signatories to the International Covenant on Civil and Political Rights. Laos became a state party to the Covenant in 2009. 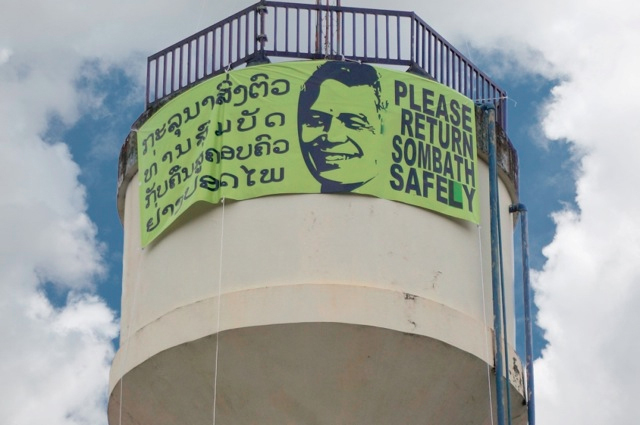 Addressing the disappearance of Sombath Somphone, an agricultural expert who vanished at a police checkpoint outside the Lao capital Vientiane in 2012, Lao delegate Bounkeut Sangsomsak refused to answer detailed questions from the Committee concerning government efforts to find the missing civil society leader. Instead, the minister to the Lao prime minister’s office and delegation head spoke of Sombath, who had challenged government land deals that had left Lao villagers homeless, as a personal friend whose “personality had changed” after his return to Laos following studies in the United States. Sombath also had previously unreported assets, including parcels of land and property in the capital amounting to from 1 to 2 million U.S. dollars, Bounkeut claimed, citing information he said he had “only recently” been made aware of. “Where did all this money come from?” Bounkeut asked. In an apparent attack on Sombath’s wife Ng Shui Meng, who has embarrassed the Lao government by campaigning tirelessly for answers to her husband’s disappearance, Bounkeut referred to Ng as Sombath’s “so-called wife,” saying no legal documents have been found to confirm their marriage. Responding to questions concerning the arrest and beating in 2017 of Lao villagers in Sekong province, including children, for “obstructing workers” and cutting down trees on village land granted by the Lao government to a Vietnamese rubber company, Lao delegate Phoukhong Sisoulath called the group “only a few people” who had refused compensation. “About 100 other families agreed to receive new land, and only a few people refused,” he said. “So I think this is not about defending the land. It’s about the ill intentions of a very small group to obstruct the development of the country,” he said. “They are clearly a tactic to divert attention away from the lack of progress in the investigation and lack of accountability on the part of the government, and to present Sombath’s abduction as a business-related crime rather than an enforced disappearance,” the researcher said, speaking on condition of anonymity. And the delegation’s comments about the detained villagers, one of whom died in custody under mysterious circumstances, were notable for what they did not reveal about the case, the researcher said. “What kind of compensation was offered to the affected families?” he asked. “What kind of land were they given in compensation? And how were the other families ‘convinced’ to accept that compensation?” he asked. “Coercion cannot be presented as consent,” he said. Reported and translated by Ounkeo Souksavanh for RFA’s Lao Service. Written in English by Richard Finney. Categories Select Category Articles & Reports Events Facts Get Involved Lao Government Statements Laos…by the numbers Letters to Sombath News Notable Quotes Points to Ponder Sombath’s Work Statements & Appeals Uncategorized What is…? Where is Sombath?